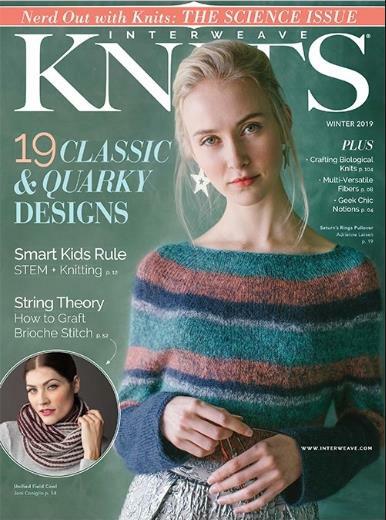 Enjoy these new knitting resources available at your Guelph Public Library. Place your requests by clicking on the book or magazine cover image. To request a specific magazine edition, please phone 519-829-4401 for assistance. 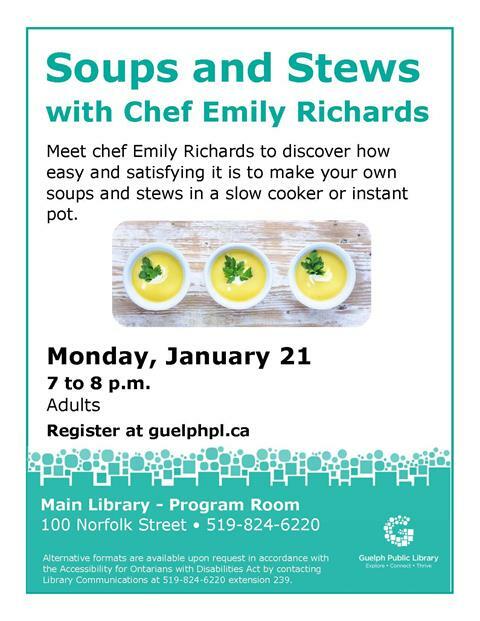 Join Chef Emily Richards for some delicious soup and stew receipes made in slow cookers and instant pots. Monday January 21 at 7:00 p.m. at the Main Library. 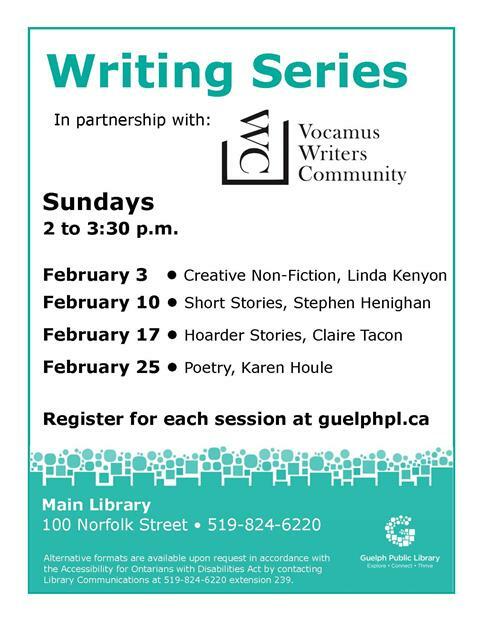 Guelph Public Library and Vocumus press are co- hosts of four authors in the February Writing Series. Join us each Sunday at the Main Library from 2 to 3:30 p.m and learn about a variety of writing subjects. 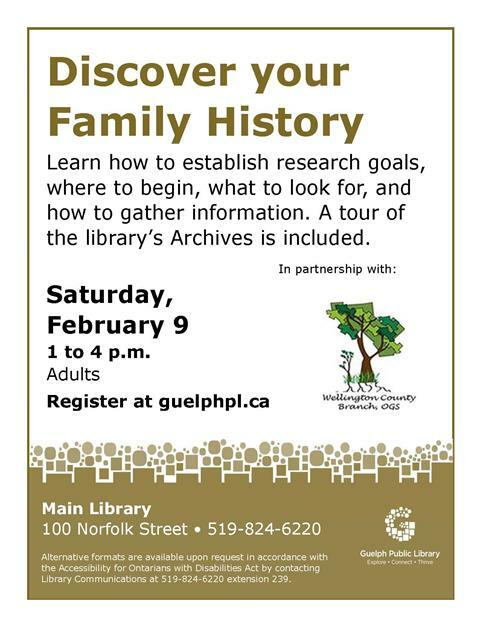 Join our Library archivist for how to guides and tips to help discover your family history. Be sure to register for one or all three of Darcy's 3 hour sessions. Sessions begin Saturday February 9, at 1 p.m. at the Main Library. 2019 Toronto Knitters Frolic will be held Saturday April 27, from 9:00 a.m. to 4:30 p.m. Admission is $10.00. Japanese Canadian Cultural Centre. 6 Garamond Court. Toronto. 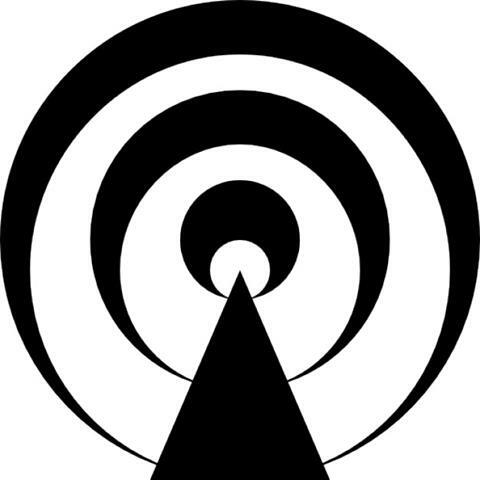 Knitting podcasts are created by knitters all over the world. In 2016 The Leaf Cutter's Devon Redmond reviewed many of them and narrowed the list to nine of the most popular. The top three on his list are Knitting Pipeline, Knitmore Girls, and the Yarniacs. If your looking for some background dialogue about knitting the next time your knitting, then these might be fun to listen too. 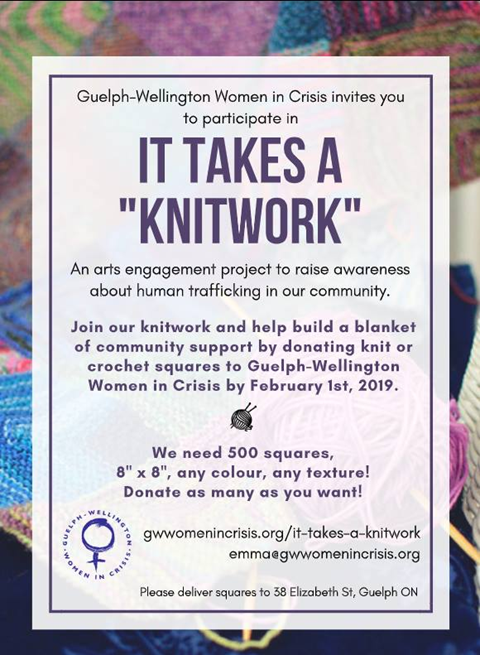 Guelph-Wellington Women in Crisis have launched a sexual trafficking campaign, "It Takes a Knitwork." They are requesting 500, 8 inch knit or crochetted squares to complete a large blanket.This blanket will be used to display throughout the Guelph -Wellington community to increase awareness of sexual trafficking that takes place here. It will also serve those who have been part sexual trafficking rings. Completed squares are requested by Feburary 1st, 2019. Westminster/St. Paul's is continuing to collect pneumonia vests for infants and children in the mountains of India. The next collection due date will be March 27, 2019. Knitting patterns for the vests are available at Bullfrog Library. Thank you so much for your generous contributions to the Red Scarf Project. Your kindness and talents go such a long way in fighting stigma and making our community more welcoming!